Museum displays, labels, and blogs provide an excellent way for us to look beyond the headlines and get to grips with the full picture. While the hubbub surrounding #beardgate has died down, I’ve kept thinking about it. 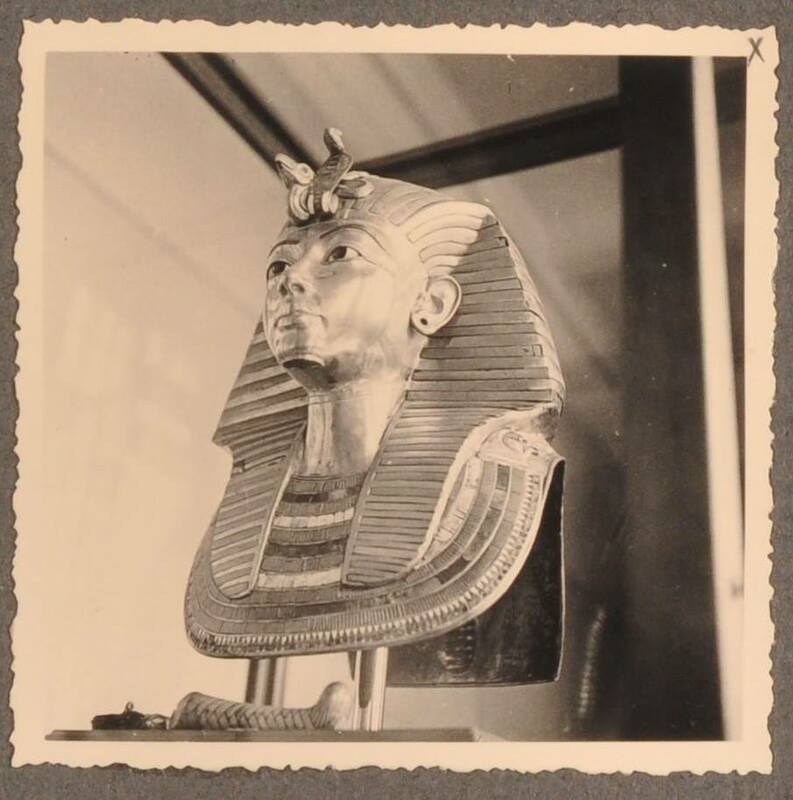 In my last blog, I included a picture of Tutankhamun’s mask without its beard, photographed during the 1920s. I meant it as a reminder that, whatever happened during the news-grabbing re-attachment of the beard, it wasn’t ‘snapped’ off. The mask was displayed without its beard in the Cairo Museum for over a decade. A friend then sent me a photograph taken in the museum by her grandfather in 1937. Mask at top, beard lying below. But what’s the lump on the bottom left? 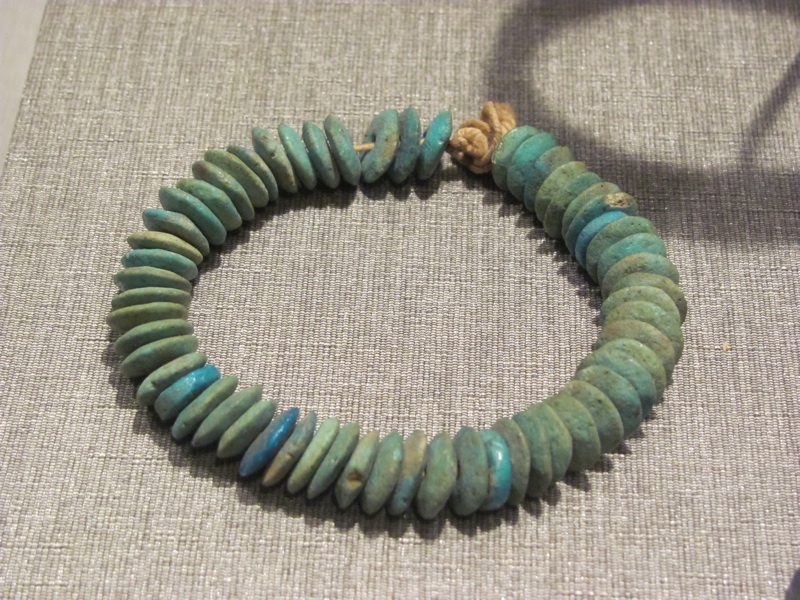 It’s part of a collar of gold and faience beads that had been attached around the neck of the mask. 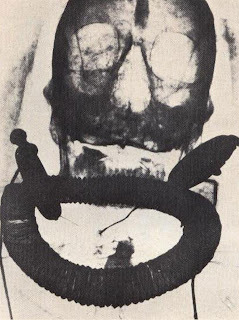 Here you can see the collar (and beard) in position on the mask as the mummy lies in the coffin. If you look closely at the mask today, you can still see the holes punched on either side of the neck to fix it in position. The collar itself is still displayed detached from the mask. It took fifteen years or so for the beard to make it back on to the mask, but the collar has still not been re-attached. Egyptologists are naturally conservative people, but this takes some beating. When the mask was taken abroad on tour in the 1970s, the exhibition catalog says that the necklace was removed from the mask for display “to reveal the neck.” Slim and elegant though Tutankhamun’s neck is, I don’t find this very satisfactory. Should we consider replacing it and restoring the mask to what it really was like? Like most questions Egyptologists ask, this isn’t expecting a yes/no answer. It’s looking for more information. Tutankhamun’s collar, with its flat disc-shaped beads, is a costlier example of the same type of necklace (shebyu for the Egyptians) as you can see in the Hall of Ancient Egypt. For non-royals, shebyu necklaces were marks of honor, royal gifts for good service. Receiving the ‘gold of honor’ was an event that merited being carved or painted on your tomb walls; when the mummy of the architect Kha, now in Turin Museum, was x-rayed, his shebyu necklace could be seen still proudly around his neck (along with some serious gold hoop earrings). For the king, the shebyu had a slightly different function: it emphasized his divinity and union with the gods – the same thing that the rituals of mummification and burial were designed to achieve once he died. It’s not surprising that the shebyu collar was an essential component of Tutankhamun’s burial, since wearing it showed that the dead king had successfully joined his fellow gods for eternity. I wonder if the reason Howard Carter could remove the necklace easily when he extracted the mask was because it was meant to be put on as part of the funerary rites that activated Tutankhamun’s mummy. What we now think of as a permanent fixture on the mask may have been intended for ‘performative’ use. Perhaps the opening of the mouth ritual that activated statues and mummies needed extra components when carried out on a royal mummy? We now see the mask first off as an icon of Egyptian culture, or a masterpiece of Egyptian art. For the craftsmen and priests who made it and installed it on Tut’s wrapped mummy, however, it was just one piece of a jigsaw of objects, spells, smells, and gestures that gave the dead king magical protection and kick-started his afterlife. Tutankhamun’s burial equipment, from the mask – beard, necklace and all – to the three coffins, stone sarcophagus, and gilded wood shrines surrounding them, was never made to be seen. It was made to do a job: to transform his body into something eternal, divine, and protected. Alter one part of this arrangement and perhaps the job would be sabotaged. Given this, there’s no single ‘right’ or ‘original’ way for Cairo Museum to display Tutankhamun’s mask and burial equipment, nor for us to display our Egyptian material at HMNS. What we can do in museums is to look after the objects in our care and make them accessible to anyone who is interested. We can keep thinking about what they may have meant to the people who made and used them, and how we can convey this in displays and labels (and, now, blog posts). Every so often, new interpretations and new objects allow us to change the way we view and display our collections. And this is the long lead in to say that we will be making some changes to the Hall of Ancient Egypt at HMNS. By the start of March, we’ll have added some new objects and tweaked our labels – and we look forward to hearing what you make of the changes. Finally, if you’re interested in finding out more about Tutankhamun’s burial, and more generally what wrapping, mummification, and burial meant to the Egyptians, here are two suggestions for further reading. The first is the Tutankhamun: Anatomy of an Excavation website, run by the Griffith Institute at Oxford University. The Griffith houses the Tutankhamun excavation archive, and has placed most of this online. You can read transcripts of Howard Carter’s notes, and see the excavation photographs taken by Harry Burton. 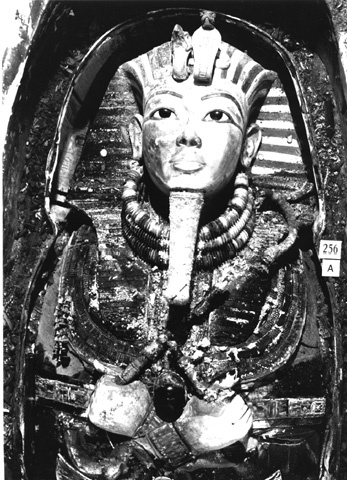 To see how the mask related to Tutankhamun’s mummy, follow this link and browse the ‘object card’ section for object number 256 (the unwrapped mummy) and its hundred-odd sub-divisions. The second is Unwrapping Ancient Egypt, by Christina Riggs (full disclosure: Dr Riggs taught me at university). Christina looks at what it meant for the Egyptians to wrap things up – to make things and then carefully hide them away under layers of cloth – and what it has meant for us, in the last two hundred years, to unwrap and display them. Next Post Top 10 Tokens of Affection from the Museum Store for Valentine's Day!